Filed to: Kamala Harris for President?Filed to: Kamala Harris for President? In 2010, questions began to surface regarding the work of Deborah Jean Madden, a lab technician in the San Francisco Police Department. A subsequent investigation found that not only had Madden tampered with evidence (police found cocaine at her apartment), but that drugs at the SFPD routinely disappeared, lab tests were not performed with scientific integrity, and the department regularly hid the criminal backgrounds of its employees. The scandal resulted in hundreds of drug convictions being thrown out, while many more defendants petitioned courts for their convictions to be wiped from the records. In a 26-page ruling, San Francisco Superior Court Judge Anne-Christine Massullo refused to overturn 60 convictions of people whose cases involved evidence from the lab. The judge did, however, note who was responsible for this mess. Massullo didn’t just blame the police or the woman at the center of the scandal (who would never be convicted). Instead, she blamed the San Francisco prosecutor. The judge noted that the prosecutor’s job is to represent the public, not the police, adding that the prosecutor willfully hid the misdeeds of the SFPD from defense attorneys. It is the opinion of many legal scholars that the root of many of the inequities in America’s legal system—including police brutality, unequal sentencing and prosecutorial misconduct—lies in the relationship between law enforcement officers and prosecutors. “At some point, we have to look at if the prosecutors are being fair,” said Stephanie Morales, the first black woman to serve as commonwealth attorney in Portsmouth, Va., and the only prosecutor in the country to successfully prosecute more than one incident of an on-duty police killing. “If we think that prosecuting criminals for violent crimes and sharing it with our communities has an impact on violence, then I think the same would be true for police officers,” she adds. But in the case of the dirty drug lab, Judge Massullo said one person failed to uphold their constitutional duties. The judge said there was one person who let the public down by carrying the water for the San Francisco Police Department. Her name is Kamala Harris. Rejoice and make a joyful noise unto the heavens! We might soon have a black woman president who dances to Cardi B! Kamala Harris refers to herself as a “career law enforcement official” in a system that is historically anti-black. As a prosecutor and as California’s attorney general, she routinely defaulted to the side of law enforcement, and now she wants to whitewash her record and use black solidarity as a footstool in her reach for power. Maybe both things are true. Perhaps neither of these are true. The candidacy of Kamala Harris is a conundrum wrapped inside a riddle buried inside a Jamaican beef patty. Rarely has one candidate evoked as many diametrically opposed opinions from the same side. There are many who see Harris’s run for the presidency in the context of black women’s importance in the Democratic Party. If the Democratic Party is to regain power, it will be because of black voters, specifically black women. Black women elected Doug Jones (D-Ala.) to the Senate instead of Horse Twitter hero Roy Moore. The 2018 elections also saw black women take positions of power as the “blue wave” swept across the country. And, yes, Kamala Harris is a black woman. But is she the black woman we want for president? That question, in and of itself, is multifaceted. How one answers depends on one’s perspective, and is loaded with multiple implications. Is sexism at play? Many have charged that if Harris were a man, her blackness would be enough. Is she scrutinized more heavily simply because black men are reluctant to support or hold a subconscious bias against black women in leadership positions? Should we root for everybody black? Both sides of the aisle play “identity politics” (“Economic anxiety” is what Republicans refer to as “rooting for everybody white.”) We know that white candidates’ records on black issues are not parsed with the same intensity. Is the past prologue? Does Harris’ past simply represent personal growth? Is what she says now more important than what she did years ago? Is any of this fair? Should we expect a flawless candidate? Since when has any black person at any company, organization or government had enough power to eliminate racism, no matter their position or title? This is the Kamala Conundrum. Harris is, at once, a heroine and a villain. She is a vision of the future of progressive politics—tough, smart and unwavering. If the criminal justice system is the enemy of our people, then Kamala Harris’ history makes her, more than any other candidate, someone who should be scrutinized. 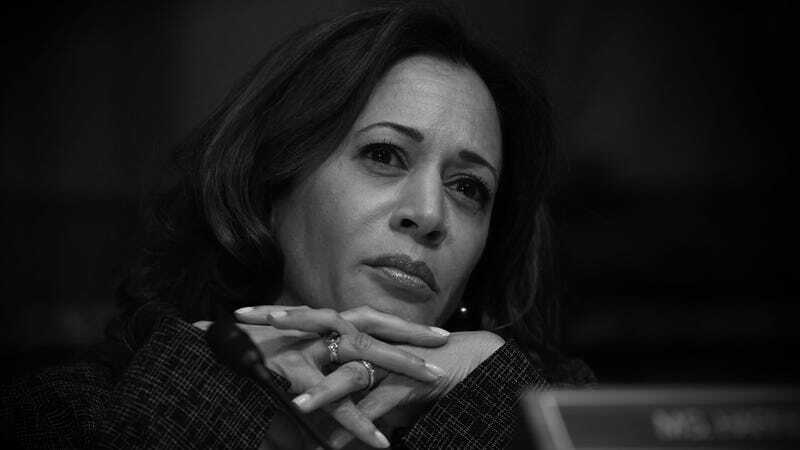 Still, the questions surrounding Harris’ candidacy are reminiscent of the echoes of the narrative by people who say “Barack Obama should have done more for black people.” If Kamala Harris’ past means she is not fit to become president, then perhaps no black person may ever be qualified for the position of president again because the path to the American presidency necessarily means one’s hands will be at least a little bit dirty. It is a journey littered with swiftboats, liberation gospel and superpredators. So what makes Kamala Harris different? Although people have compared Kamala Harris to Barack Obama, aside from being the daughter of a black immigrant father (Harris’ father immigrated from Jamaica, her mother came to America from India), the two are nothing alike. In contrast with the usual left-leaning progressive politician and Obama’s moderate stance, Kamala Harris is a pit bull. Obama attended Occidental College as an undergrad while Harris attended the historically black Howard University. Obama worked as a community organizer. Harris cut her teeth in politics as the district attorney of San Francisco and as California’s attorney general before she became the junior senator from the state of California. Her progressive bona fides are impressive. As a district attorney, she refused to enforce the death penalty, even under pressure to hand the ultimate penalty to a man charged with killing an undercover cop. During her tenure as California’s attorney general, she urged the Supreme Court to allow the state’s universities to consider race in admissions decisions. She made every state trooper undergo bias training. She created a program that offered job training for first-time drug offenders. As a member of the Senate Judiciary Committee, Harris’ unrelenting outspokenness placed her in the spotlight as one of the few attack dogs in the Democratic Party. She pressured the FBI on white supremacist extremism. She pilloried Republicans for nominating beer aficionado Brett Kavanaugh to the Supreme Court. She introduced a bill to make lynching a federal crime. Her first bill as a senator was on bail reform. She told The Root in a previous interview that she is willing to lead a national conversation on reparations. Despite these credentials, does Harris’ past, which she refers to as “smart on crime,” eliminate her as a viable candidate? The Root reached out to the Harris campaign and they declined to make the candidate available for an interview for this piece and declined to go on the record. We also spoke to an inside source familiar with Harris’ positions to form a clearer picture of the presidential contender. Johnson is right. Harris’ record on mass incarceration, over-policing and funneling people through the criminal justice system doesn’t hearken back to a more simple time when it was OK to call black men “superpredators” because no one had any idea that black lives mattered. It is now. Even though her detractors cast it as an example of how she was willing to protect law enforcement officers from scrutiny, the senator still maintains her legal position was and is correct—a district attorney cannot hand over personal information about police officers without court approval. In hindsight, it seems as if Harris’ legal position was correct. In an eerily similar 2017 incident, a state appellate court blocked the Los Angeles County Sheriff’s Department from disclosing a list of police officers. That case has been appealed to the California Supreme Court, where it remains pending. In one of her final cases before becoming a senator, Harris’ office decided not to prosecute the L.A. County Sheriff’s Department in the disappearance of Mitrice Richardson, a woman who was found dead after she was suspiciously released from police custody. In 2015, a judge refused to indict a man facing life in prison after it was discovered that a California prosecutor had falsified the defendant’s confession. Harris appealed, arguing that falsifying the confession wasn’t necessarily prosecutorial misconduct. Harris only changed her stance after a judge threatened to “name names” and federal judges accused California prosecutors of engaging in an “epidemic” of prosecutorial misconduct under Harris’ watch as attorney general. That same year, an assistant district attorney discovered hidden files showing that a prosecutor was placing paid informants in jail cells with people who were awaiting trial, then keeping the information in a secret database for years. One of the victims was convicted of a murder he swears he didn’t commit. Kamala Harris was asked to investigate. When these facts are singled out and put under a microscope, it looks like Harris is guilty of upholding a system she now claims she wants to dismantle. But if one parsed the microscopic details of anyone who has ever served as a prosecutor or attorney general, they would be able to find circumstances similar to Harris’. Maybe Harris was a part of the problem. Maybe she was supposed to singlehandedly dismantle the criminal justice system of the largest state in America. Or maybe she was simply doing her job. Perhaps Harris is simply a politician. Harris has stated her moral opposition to capital punishment and told San Francisco’s notoriously left-leaning electorate that she wouldn’t seek the death penalty as a prosecutor. She stuck to her word, too. In 2004, she refused to seek capital punishment in the case of David Hill, who allegedly killed a San Francisco police officer. But in 2014, as California’s attorney general, she appealed a federal judge’s decision that California’s death penalty was unconstitutional. In her 2009 book, Harris wrote that “the left” needs to get over its “biases against law enforcement.” At the time, Harris was running for attorney general on a platform of being “smart on crime,” which apparently meant sponsoring a bill that would send parents to jail if their children missed too many days in school. “When I did it, I knew I was going to take a political hit,” Harris told The Root in a previous interview, noting that the law resulted in a dramatic decrease in truancy. “I did not intend to put any parent in jail and no parent went to jail,” Harris added. But that latter part is not true. Harris has argued in the past that the initiative had a positive effect on truancy rates, her camp telling Jezebel’s The Slot: “Sen. Harris believed that a critical way to keep kids out of jail when they’re older is to keep them in school when they’re young.” Also, the above-mentioned case did not occur under Harris’ watch as a prosecutor, as she ended her time there in 2011. As San Francisco’s DA, she did not specifically jail parents. However, she is consistently credited with sponsoring and implementing the policy that eventually led to at least one parent’s incarceration. And in 2010 she admitted to prosecuting 25 parents under her initiative that exposed parents to criminal charges. In a 2010 speech, she bragged about telling homicide and gang prosecutors to “look really mean” when talking to parents about her truancy law. Harris now supports marijuana legalization even though she publicly laughed at a New York Times article that proposed legalizing recreational cannabis back in the olden times of 2014. When asked about her opponent’s support for recreational marijuana in 2014, Harris simply replied, with a laugh: “Umm ... He is entitled to his opinion.” However, the attitudes of most Americans have changed about marijuana legalization, according to Pew Research. The next year, California prisoners won a landmark lawsuit against the use of solitary confinement in the state prison system. As attorney general, Harris’ office tried to have the case dismissed by arguing that the “high-tech hellhole” called the Security Housing Unit (SHU) shouldn’t be considered solitary confinement because solitary confinement didn’t exist in California. Yesterday, I vacuumed the stairs. When she refused to take sides on a sentencing reform proposal, Harris remarked that her position as attorney general made it “improper for her to advocate.” The former California AG also says she didn’t take a position on legislation that would create special investigations for police shootings because she “had a process when I was attorney general of not weighing in on bills and initiatives.” However, she often released statements of support for legislation and initiatives. But since when has anyone, especially a black woman, had the power or political capital to overhaul the system? Compare Harris’ record to Kirsten Gillibrand, who was far more right-leaning early in her career. No one mentions that before Garry McCarthy hid the tape of Laquan McDonald’s murder from Chicago’s citizens, he was hired by then-Mayor Cory Booker to crack down on crime in Newark, N.J., and was accused of multiple counts of corruption and misconduct. Is Bernie Sanders even a Democrat? And remember that entire first part of this story? How would any responsible party hold Harris responsible for the crimes of a corrupt cocaine fiend or a rogue prosecutor or two? Or a rogue cop? Well ... a few rogue cops. Are we doing what America often does—just blaming the black woman? If the black woman chooses the position, where else should we point our fingers? Doesn’t blame come with the position? If Sen. Harris can distance herself from these isolated cases and claim no responsibility, then what happens when and if she becomes president? Isn’t that what she signed up for? Unlike others who have already thrown their hats into the ring, Harris did not have to compromise on these issues. She was not a state lawmaker who had to compromise and vote for a coalition. She was the top prosecutor in San Francisco. She was the chief law officer and head of the justice department in a state whose population is bigger than Canada or Australia. There is no reason to speculate. She’s been the HNIC. It might certainly be possible to cherry pick the flaws of any political candidate who made their career in law enforcement and make them into a villain. It is also possible to excuse these incidents as someone who is only doing her job. If the criminal justice system is racist, does that necessarily make the people who willingly work inside the system responsible for the outcome or are they just cogs inside an unstoppable American machine? Perhaps this criticism, however harsh, might be the brightest point in all of this. Kamala Harris’ flaws might be significant, but the criticism comes from an examination of her policy and her past. Many of the people who love Harris have seen her on television ripping apart her conservative counterparts and fighting for the values they believe in. She is a newer, aggressive progressive who is willing to fight. Taken at her word, Harris is exactly what America needs. But her deeds make it hard. Those who are reluctant to offer their support after examining her record also have a point. Her past is not prologue, because it is not even her past. Even if she has grown or changed, we have seen the wolf unzip his sheepskin cloak and devour the lambs too many times. For black people, our survival sometimes depends on having a healthy skepticism. But we also want to root for everybody black. FBI to Senate: We’re Investigating 1,000 White Supremacists. Senate to FBI: That’s All?